You’ve probably heard of Uber by now, and maybe even used the service. Uber Eats is a bit different, since you’re driving meals to customers rather than people to places. This is why you don’t need a late-model car for Uber Eats, as you would if you were driving people with Uber. Just about any vehicle will do. To find out more now, click here. You’ll have an app that you’ll log into when you’re ready to start delivering. Uber Eats is available 24/7, and you can choose your own hours. Orders will come in on the app, with the location of the restaurant for pickup and other details. You can decide whether you want to accept any order; it’s up to you. Hourly pay varies widely, depending on such factors as the metro area, whether “surge” and “boost” rates are in effect, how you manage your orders, and tips. (Keep in mind, too, that you’ll have expenses like gas, car maintenance, etc.) Tipping was a sore point with many Uber partners — earlier policies discouraged it — but Uber has since changed course and made tipping easier. But much will depend on your metro area and the types of customers you’re serving. Uber partners do say you can easily increase what you make by driving during surge times — busy periods around lunchtime and dinner. Another strategy is to wait to turn on the app — which tells Uber you’re available for orders — until you’re in an area with a high density of restaurants, and lots of people living not far away (more orders with less driving distance). For more detail, click here. 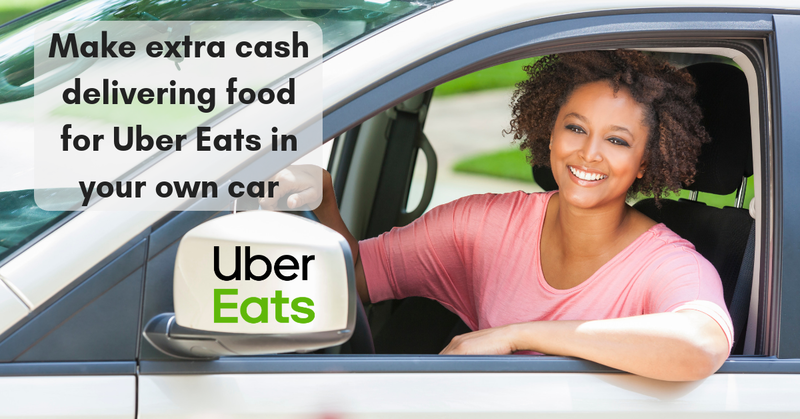 For more on the other Uber opportunities, delivering folks rather than food, click here. For more gigs like this, see our Newest Jobs & Gigs page. Happy Driving! This entry was posted in Driving & Delivery Jobs, Earn Extra Cash, Jobs That Don't Require a College Degree and tagged UberEats. Bookmark the permalink.